A major mystery surrounding the Moon's origin and early composition may have finally been solved by a team of Israeli astrophysicists. According to the giant impact hypothesis, the Moon formed when a Mars-sized protoplanet, dubbed Theia, slammed into Earth some 4.5 billion years ago. It wasn't a direct hit, otherwise both objects would have been completely annihilated. Instead, the glancing blow produced a massive debris field around Earth, which eventually gathered together to form the Moon. It's a great theory except for one glaring fact: the geochemical attributes of the Earth and its impactor are freakishly similar, leading to the so-called "isotope crisis." Theia should feature a markedly different isotopic makeup than Earth, similar to the way other planets in the Solar System are chemically different than Earth. But these two objects are practically identical, which is really weird. Astronomers have estimated the probability of this at a scant 1%. It's hard to hinge a theory, therefore, on something so improbable, hence the ongoing uncertainty about our moon's origin. Using advanced computer modelling, Mastrobuono-Battisti and colleagues ran dozens of simulations of later-stage planet formation, each time starting with 85 to 90 planetary embryos and 1,000 to 2,000 planetesimals extending from about halfway between the orbits of Mercury and Venus to within 50 million miles or so of Jupiter's orbit. 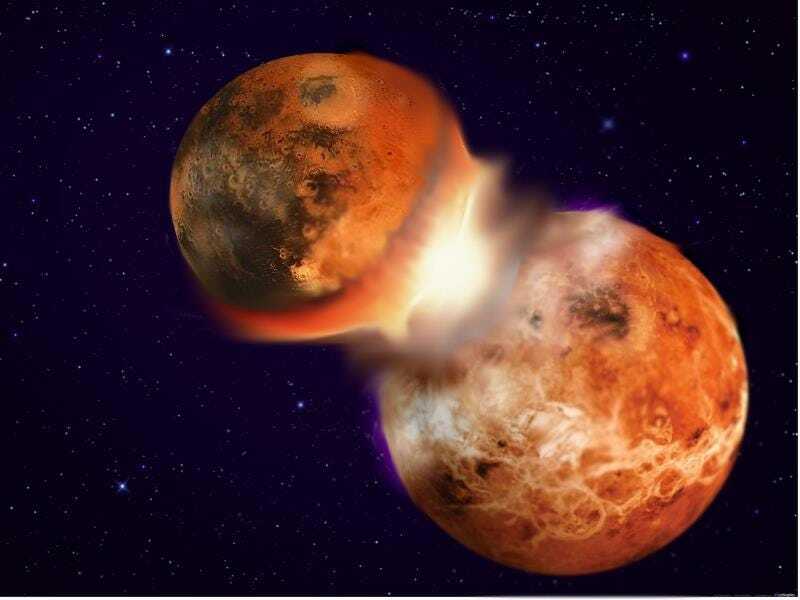 Within 100 million to 200 million years, each simulation typically produced three to four rocky planets as a result of colliding embryos and planetesimals, the scientists found. Looking particularly at the last moon-forming impact scenarios, the scientists assessed the likelihood that Theia and Earth had the same chemical composition. So the actual probability is closer to 20 to 40%. This suggests a couple of things. First, we can now be more comfortable in saying the Earth was struck by a chemically similar embryonic planet. Second, it means that Earth and its sister-planet formed in the same environment. The Earth's twin may be dead, but it lives on in our night sky. Read the entire article at ABC Science. And check out the entire study at Journal: “A primordial origin for the compositional similarity between the Earth and the Moon”.